In late 2012, Microsoft release the specification “DASH Content Protection using Microsoft PlayReady,” which explained how to use PlayReady with Common Encryption and MPEG-DASH. In June 2013, Windows Azure Media Services added the support for MPEG-DASH as a new Dynamic Packaging output. At IBC 2013, Microsoft officially announced a new PlayReady version supporting HTML5, Encrypted Media Extensions, as well as new SDKs for iOS and Android. Their recent NAB 2014 announcements show how much work has been done under the hood to support DASH on the maximum number of platforms. We put a few questions to the Windows Azure Media Services team—namely senior digital media architect Kilroy Hughes, principal program manager lead John Deutscher, program manager for dynamic packaging Nick Drouin and program manager for client SDKs Cenk Dingiloglu. Here’s what they told us. Streaming Media: What’s your current coverage in terms of DASH support? Microsoft has developed a variety of DASH clients, tested to work with the Azure Media Services, which will enable playback of compatible DASH profiles when DASH streaming service and players are made “generally available” (public release on the Azure platform). Several players also support the Smooth Streaming format for mixed environments introducing DASH in combination with existing Smooth services. PlayReady DRM is also supported. Microsoft has produced PlayReady SDKs for both iOS and Android devices that include support for DASH. Microsoft has also released a public specification for how open source browsers can interface to a PlayReady platform component and has provided PlayReady licensees with sample code for implementing that interface, making it easier for embedded devices such as set-top-box and televisions to implement DASH with PlayReady. Azure Media Services is also testing scalable PlayReady licensing services. At the time of this interview (March), only Microsoft-supported DASH test environments have been publicly deployed, such as Internet Explorer TestDrive and test servers for the DASH.js open source player project. Microsoft services and devices have been testing DASH, and DASH services and clients will be available by the time this article is published. Customer implemented DASH services will be supported when General Availability of DASH on Azure Media Service is announced soon. When Azure Media Services DASH is generally available, all video files encoded on the Azure Media platform or uploaded in a compatible format will be available on request in DASH media and manifest format. DASH VOD is available for testing today on Azure Media accounts, but is not fully supported with documentation, tools, etc. By the time people read this, it will be Generally Available and fully supported. Live DASH channels will be available later as part of the live service offering. Azure Media origin servers create manifests and media segments on request in the format indicated in each HTTP URL, so it is the player’s choice whether to request DASH, Smooth, HLS, or HDS from a single elementary stream. 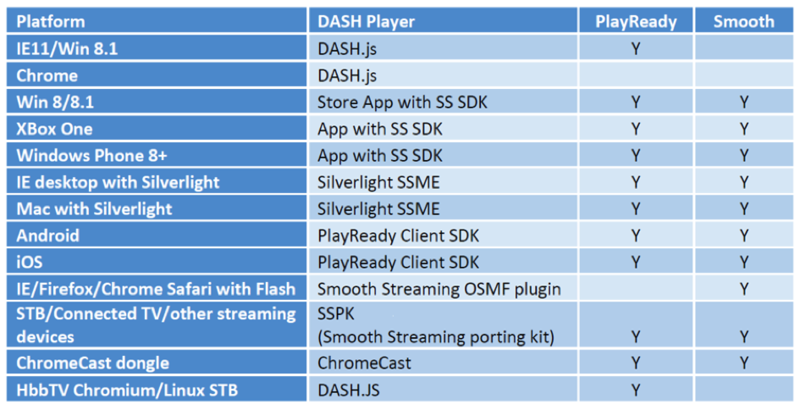 DASH players that are routinely tested include the DASH.js script player running on Internet Explorer 11 and Chrome browsers on Windows 8.1, DASH.js on WebKit browsers developed for connected TVs and set top boxes, a native Windows 8 app for Surface, etc., an updated Silverlight player that streams both DASH and Smooth formats and supports PlayReady DRM on older operating systems, browsers, PC, Mac, XBox and Windows Phone, and a Flash OSMF plugin that works on most browsers, but without DRM. What is the DASH profile generated by Azure Media Services? Do you plan to support more profiles? Azure Media servers produce DASH ISO Media Live Profile that conforms to DASH Industry Forum guidelines and UltraViolet Common File Format, optionally including MPEG Common Encryption. These Media Segments and MPD manifest are expected to be compliant with specifications in DLNA, DTG, DVB, EBU, HbbTV, and other organizations defining interoperable DASH application formats and players.